Foreign Minister Mevlüt Çavuşoğlu called on Iran and Russia to fulfill their duties as guarantor states in Syria and stop the Assad regime's increased violations in Idlib. "Iran and Russia need to realize their duties. If you are the guarantors, stop the regime. It's not just a simple airstrike. The regime is moving in Idlib. The intent here is different," Minister Çavuşoğlu said Wednesday speaking with Anadolu Agency in a televised interview. The foreign minister's comments came after beleaguered Syrian regime forces recently advanced on the largest moderate opposition-held enclave in the country's north amid a wave of airstrikes. Following the regime's assaults, tens of thousands of people fled the province. Çavuşoğlu stated that they were expecting some cease-fire violations during the process; however the latest situation went beyond the limits. He added that Russia and Iran have no excuses on attacks by the regime, noting that the duty falls upon the guarantor states to maintain the de-escalation zones, which were established during the Astana, Kazakhstan peace talks. Highlighting that the latest wave of assaults have been endangering the ongoing efforts to reach a political resolution, Çavuşoğlu said the regime is targeting the moderate opposition and civilians under the pretext of fighting terrorist groups including the Hayat Tahrir al-Sham (HTS), formerly known as the Nusra Front, located there. As part of the de-escalation zones, agreed in a tripartite consensus between Turkey, Russia, and Iran, Turkish forces are also currently in Syria's Idlib province, which is also bordering the People's Protection Units (YPG)-held Afrin region, monitoring the process in military posts. Çavuşoğlu stressed that even though Turkey has been trying to enforce cease-fire to enable the return of the civilians in Idlib, some terrorist groups have infiltrated into the region. "If there is a terrorist organization in a region, its location needs to be determined through field work and intelligence sources, and careful operations can be carried out against them accordingly," he said, adding that what is currently happening in Idlib is unacceptable as civilians and moderate opposition forces are being attacked. The violations taking place in besieged areas, including Idlib, where some terrorists were able to enter, especially pose threats to civilians, Çavuşoğlu said, adding that it is not logical to completely shell besieged areas. The recent assaults on Idlib have also prompted international rebuke as thousands of civilians were trapped in the conflict zone. The U.N. has drawn attention to the humanitarian issue. "Due to the ongoing reports of airstrikes and fighting, tens of thousands of civilians, already in extremely dire circumstances, have been displaced to northern Idlib governorate and neighboring Hama and Aleppo governorates since Dec. 1," the U.N. Office for the Coordination of Humanitarian Affairs (OCHA) in Syria said Monday. In relation to the issue, Turkey has summoned the ambassadors of Russia and Iran on Jan. 9 to convey its discomfort of the Assad regime's violations of the de-escalation zone borders in Idlib. Underlining that attacks on the moderate opposition by Assad regime forces harm the efforts to reach a political solution, Turkey has demanded that the violations should end until the "Syrian National Dialogue Congress" is held on Jan. 29. 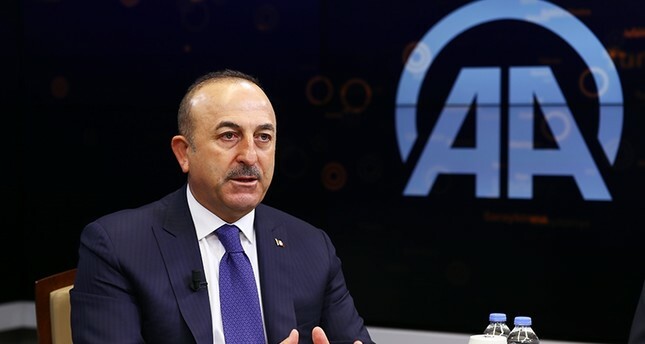 Commenting on the upcoming summit that will be held in Russia's Black Sea city of Sochi, Çavuşoğlu reiterated Turkey's line that it will not accept YPG in the meeting. Later on Wednesday, Turkish foreign ministry sources said that a top U.S. diplomat had been summoned to the Foreign Ministry to protest Washington's support of the PKK-linked YPG militia in Syria. "We shared our concerns about the US giving armed weapons' training to members" of the Syrian Kurdish Democratic Union Party's (PYD) militia with the U.S. charge d'affaires Philip Kosnett, Turkish foreign ministry sources said. The sources did not give any further detail. Kosnett is currently the most senior American diplomat in Ankara after the departure late last year of the ambassador, John Bass. His replacement has yet to be named. Turkey and the United States have been at loggerheads over Washington's policy of support for the YPG, which Ankara views as an extension of the PKK that has waged a war in Turkey's largely Kurdish southeast for more than three decades. Turkey has been sternly warning its allies that the terrorist groups should not play the slightest role in the future of war-torn Syria. All segments of Syrian society except for the terrorist groups are expected to attend the Syrian National Dialogue Congress with the participation of about 1,700 people. The foreign minister also noted that they plan to hold a meeting on Syria with like-minded countries in Turkey. Kremlin spokesman Dmitry Peskov said Wednesday that no meeting is planned between the leaders of Turkey, Iran and Russia ahead of the Syrian National Dialogue Congress at the end of this month. Meanwhile, as opposition groups continue their assaults on the regime, Russia claims it has been subjected to assaults as well. The Russian Defense Ministry announced that a series of attacks on its Hemeimeem air base and a naval facility in Tartus in Syria with 13 drones have been averted. Following the incident, the Russian Defense Ministry stated that seven drones were shot down and six were forced to land without causing any damage. The ministry also said that the drone attacks would have required assistance from a country which has satellite navigation technology; the statement is considered to be directed at the U.S. because at the moment of the attack a U.S. military intelligence plane was flying over the Mediterranean near the bases. Upon the allegations, U.S. Marine Maj. Adrian Rankine-Galloway, a Pentagon spokesman, said that "any suggestion that U.S. or coalition forces played a role in an attack on a Russian base is without any basis in fact and is utterly irresponsible."